Does your short hair seem like it is getting more difficult to curl each time you go to do it? Maybe the problem does not lie with your technique but maybe you are not using the right curling iron. 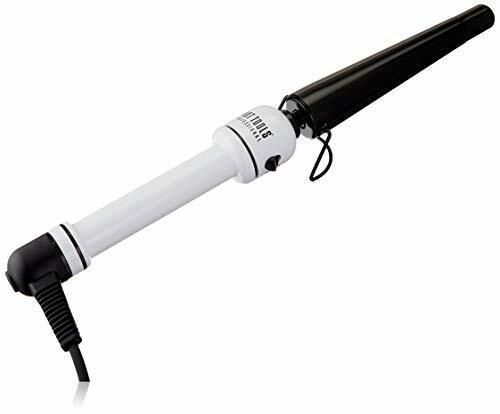 Many users seem to think the Hot Tools HTBW1852 Curly-Q Curling Iron is the perfect tool to use when curling short hair. If you have problems curling your short hair on a regular basis you will want to read along as we review this product. You just may come to find out it is the right curling iron to solve your short hair curling problems. You really have a lot of different curling choices with this curling. It features some 30 different heat settings (280°F to 450°F) that you select using a convenient rheostat control wheel. It puts you in charge of what temperature you want to curl your short hair at. Its tapered barrel (1/2” to 1 ¼”) is also nicely coated with NanoCeramic particles. These offer you many advantages when curling your short hair. Some of them are that they enable this curling iron’s barrel to heat up quickly and to also heat up evenly. This technology even helps your hair retain its moisture better and helps it look shinier after it has been curled. You will get a lot of freedom of movement with this curling iron too. It has a generous size 8-foot power cord. This power cord features an attached swivel end that keeps it from tangling up as you use it too. 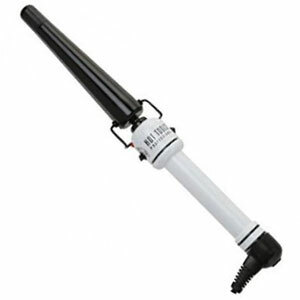 There are several safety features built into or included in this curling iron package also. 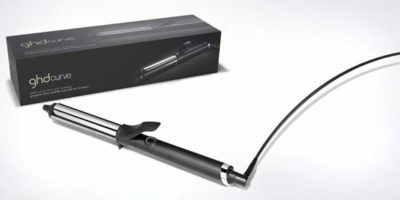 The Hot Tools HTBW1852 Curly-Q Curling Iron has a built-in automatic shutoff and a safety cool tip. Included in the package is a heat resistant styling glove and a folding safety stand to rest the hot iron on when you are not using it. There are two main reasons why this curling iron works well on short hairstyles. We have already mentioned that it has some 30 different dial-up heat settings. There is no one size fits all temperature setting which is ideal to curl everyone’s short hair. Having some versatility in the heat selection enables you to find the perfect temperature that works great when you go to curl your short hair. The tapered barrel is a big bonus too. It is small enough at the tip that you can even curl very short hair and large enough towards the barrel so you can create larger and more voluminous curls. We do not really like the warranty that comes with this product much at all. It has a 1-year warranty which is below the industry standard for its price range. Another concern is the fact that the Hot Tools HTBW1852 Curly-Q Tapered Curling Iron lacks a spring clamp. Short hair can be difficult to curl with curling wands that lack this feature. Yes, there were some concerns with this product but none that we would consider deal breakers by any means. We all think this is a very versatile curling iron too that will give you many options when you curl your short hair. Definitely not to be overlooked are its some 30 different temperature settings and its moisture retaining NanoCeramic barrel coating (this gets even better if you have fine, short hair). The Hot Tools HTBW1852 Curly-Q Curling Iron is definitely a model you want to consider when looking for a new curling iron to curl your short hair with.